A dazzling, whiter smile is attractive and a sign of self-confidence. In our office, this can be achieved in 1+ hour. Having performed over 700 cases of tooth whitening the past 10+ years, we are positive that you will be happy with the result. Currently, we are using Xtra Boost (Ultradent). To ensure that you are receiving the best possible care chairside, Dr. Wong will perform everything from isolating the teeth to applying the whitening gel himself. ** As of April 13, 2009, we use exclusively the newly improved Ultradent Boost Xtra and the results have been remarkable. The fee for this 1+ hour chairside tooth whitening procedure is $484 which includes clear custom trays and a supply of whitening gel for your future touch-up. This 24-year-old man is interested in having his teeth whitened. The initial shade is recorded — a mid-range reading of A3. the final shade is off the chart at OM3. 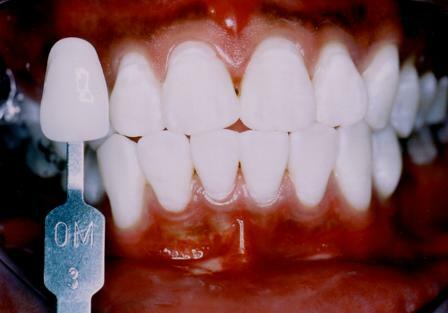 Very challenging case: this 25-year-old patient had an mid-range initial shade of A3.5 with the middle 1/3 of his teeth a very dark shade of D4. his teeth are now uniformly white. This 23-year-old woman was determined to be a good candidate for ‘Deep Bleaching’. An initial shade of C1 was taken. Post-op photos: After two 1-hour sessions of chairside treatment, her teeth are almost ‘snow-white’! Laura F.: I want to let you know about the many positive comments I have received since you bleached my teeth!! Just a few minutes ago, someone commented on how bright & young my smile looks! And my husband, Ethan, is also very happy with my new smile. It absolutely is the best thing I’ve done for myself lately. My only regret is that I did not do it sooner. Thank you! Jason R.: Dr. Wong’s professional treatment took many years of coffee and soda stains away, and greatly improved the shade of my teeth. I could not find one place that performed such a complete process for anywhere near the cost of Dr. Wong’s service. I will definitely be back for my dental needs in the future because of the exceptional service I received. Heather A.: I would highly recommend the teeth whitening process offered by Dr. Ernie Wong. I had recently quit smoking and wanted to reward myself by starting with a bright smile. I had tried over the counter products in the past and they were ineffective and messy. Dr. Wong’s process only took an hour and took off years of coffee, red wine and cigarette stains. His friendly demeanor and attention to detail were also greatly appreciated. Tooth whitening can brighten up your entire face, and it is a procedure that is constantly in demand. Dr. Wong takes the time to make sure your results look natural while ensuring your comfort and safety throughout your tooth whitening treatment. The results Dr. Wong offers are more dramatic and lasting than other methods of tooth whitening (OTC tooth whitening gel, tooth whitening strips, tooth whitening toothpaste, tooth whitening mouth-wash,..etc). As time goes by, our teeth lose their natural brightness and appear aged. Like fine china, teeth become dull and stained from a variety of factors including tobacco, drinking coffee, dark soft drinks, red wine or tea. This is where tooth whitening comes in. Throughout history, people have sought new methods of tooth whitening. Ancient Egyptians used a dental cream made from oxen hooves mixed with burned egg shells, pumice and water for their tooth whitening needs. Upper-class Romans added expensive imported urine to their tooth whitening mix (unaware that it was the ammonia molecules that were brightening their teeth). In the 14th Century, tooth whitening was the most popular dental request, after tooth extraction. 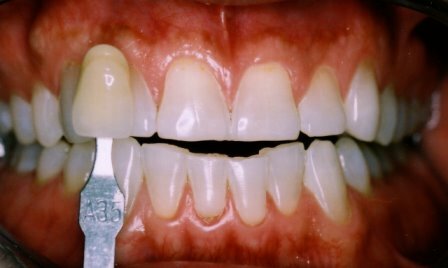 The patient’s teeth would be filed with a coarse metal instrument, then washed with aquafortis, a solution of highly corrosive nitric acid that whitened but permanently damaged them. 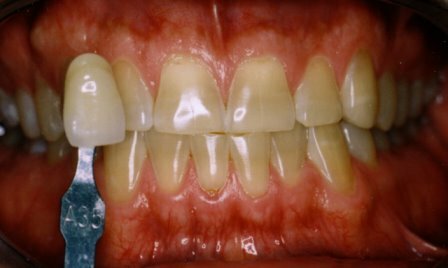 Regardless of how well you care for your teeth, it is inevitable that, over time, some yellowing or discoloration will occur. This gradual change can be caused by aging, substances that stain your teeth (such as coffee and tobacco), excessive fluoride, or the deterioration of a tooth’s nerve. Modern technology offers us tooth whitening without harmful side effects. We offer tooth whitening treatments in our San Diego office and tooth whitening treatments for you to use at home. While neither of these methods stops future discoloration, these tooth whitening treatments bring about whiter teeth and help create a brighter smile. The most popular method of tooth whitening is the at-home, dentist-supervised option. During your visit to the dentist for tooth whitening, he or she takes a mold of your teeth and creates a comfortable, customized mouth tray. The mouth tray holds a mild solution whose main ingredient is carbamide peroxide, a substance that reacts with water to release a non-toxic bleaching element (hydrogen peroxide). The mouth tray is placed inside the mouth and sits only against the teeth, thereby avoiding contact with the gums. Patients can choose either to wear the mouth tray throughout the night or for stretches that last from two to four hours. 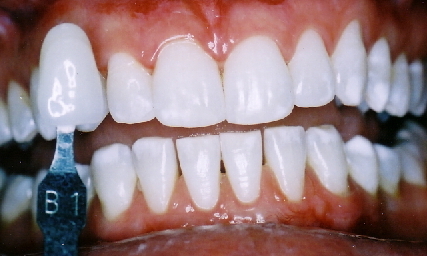 When the mouth tray is worn throughout the night, the tooth whitening treatment lasts one to two weeks. Patients with more sensitive teeth may opt for the latter approach, which lasts three to five weeks. The alternative method for tooth whitening is a laser procedure, performed at the dentist’s office. This tooth whitening treatment involves coating the teeth with a paste-like form of carbamide peroxide. When the laser is applied to this paste, the tooth’s enamel takes on a whiter appearance. 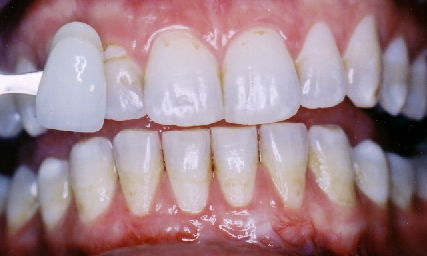 This tooth whitening technique lasts approximately one hour in the dentist’s chair and involves no further at-home tooth whitening treatment. While more convenient than take-home tooth whitening treatments, it is generally more expensive. When using the at-home tooth whitening treatment, patients’ teeth may feel a heightened, but temporary, sensitivity. The gums may also feel more sensitive or burn slightly. Not all people experience the quality of whiteness they had hoped for on their first tooth whitening treatment, and they may require a “touch-up” treatment. 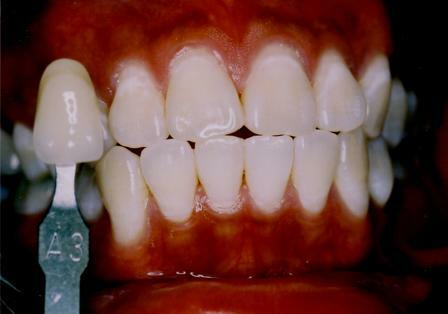 Tooth whitening treatments begin to fade in one to four years. It should be noted that tooth whitening treatments have no effect on the artificial materials used for bonds, porcelain veneers, or capped teeth. If you are interested in learning more about teeth bleaching or other cosmetic dentistry procedures, please contact cosmetic dentist Dr. Ernest Wong – who practices in San Diego. Take advantage of a "No Interest Payment Plan" and get the smile you always wanted TODAY! Read 'certified' comments from Dr. Wong's patients or schedule an appointment online!